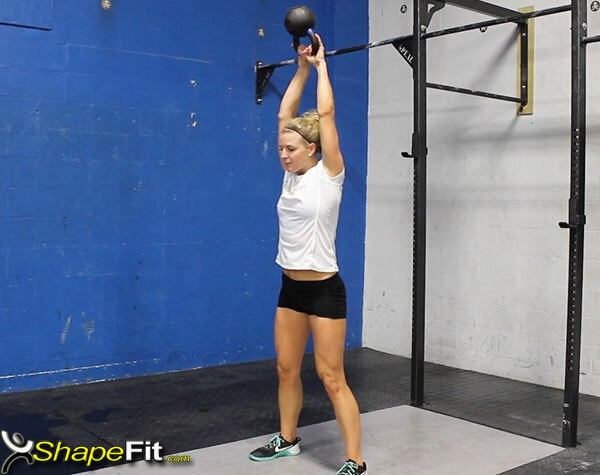 Muscles Targeted: The kettlebell swing is one of the most popular exercises used in CrossFit. It’s an excellent movement for targeting the entire body while also getting a great cardiovascular workout. When performing the kettlebell swing, the large muscles that are engaged include the hips, hamstrings, quadriceps, latissimus dorsi, gluteus maximus, abdominals and deltoids. Performing this exercise provides a very effective way to achieve a total body workout in a short amount of time. Exercise Instructions: There are multiple ways one can perform this exercise, both of which are very similar with only a minor modification. Begin by choosing a kettlebell with a weight that you feel comfortable using. In the first version of this exercise you need to stand with your legs spread shoulder width apart. Using a two-handed, over hand grip on the kettlebell, hold the weight between your legs. While grasping the weight, begin to swing the weight forward out in front of your body until the kettlebell is above your head, all while keeping your arms straight. During this motion, be sure to keep your back flat with your chest out and shoulders back. From the top position, bring the kettlebell back down between your legs and end in a squat position. This completes one full repetition of the kettlebell swing. Be sure to keep good posture throughout the entire range of motion. If you will be performing multiple repetitions, then bring the kettlebell back until it is slightly behind your legs with your arms still straightened. At this point you will proceed to squeeze your glutes in order to extend your hips, as if you are coming up from a squat to stand up straight and swing the kettlebell back up until it is above your head. In the second version of this exercise, you will swing the kettlebell up, and instead of going all the way above your head, you will stop when the kettlebell reaches about eye level. You will still be performing every other motion in the same manner as in the initial version, but in the second version of the kettlebell swing, you will simply keep the range of motion limited to eye level (versus overhead). Always be sure to swing the kettlebell in a smooth and controlled fashion at all times. This will ensure that the muscles are being worked properly and that you do not injure yourself. Things To Avoid: While performing this exercise you must be sure to choose a weight that you are comfortable with. Focus on your posture continuously throughout the exercise. If you do not have proper form throughout the range of motion, it will not be as effective and you may even end up hurting yourself. You also want to be sure to have your knees slightly bent with your body positioned in an athletic stance throughout the exercise. You do not want to have your knees locked. Do not swing the kettlebell too quickly either. Set a steady pace and stick to a fluid motion where the kettlebell is completely controlled at all times. Be sure not to let your hips drop down too far. You’re not performing a full squat, so don’t go down to parallel (90 degree angle) with your thighs. Reps and Sets: Always begin with a very light kettlebell when first starting out with this exercise. Once you have mastered the proper technique, you may increase the weight. If your goal is to build muscle then you will want to use more weight and do a moderate amount of reps in the range of 8-12 per set. If you want more of a cardiovascular workout, shoot for higher reps in the range of 20-30 per set. This can be a very intense exercise when you’re doing high repetition training so make sure you maintain strict form throughout the duration of your workout.